12 News in Phoenix covered the presentation recent presentation by Ray Krone, who was exonerated after being sentenced to death, and Joe Hedgecock, who was on Krone’s jury. For more information about this and other Death Penalty Alternatives for Arizona events, please contact us at info@azdeathpenalty.org. Two separate trials found Ray Krone guilty of murdering a Phoenix woman in 1991. DNA evidence later cleared Krone and identified the actual killer. He was on Arizona’s death row when he was exonerated in 2002. 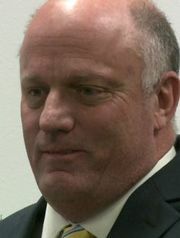 Joe Hedgecock was a juror who convicted Krone. Both give a chilling account of their experiences with the criminal justice system and the lessons that can be learned. You can learn more about the event at this link, or you can download a flyer by clicking here. This event is cosponsored by Death Penalty Alternatives for Arizona, the Arizona State University School of Criminology and Criminal Justice, the Arizona State University Sandra Day O’Connor School of Law, and the Justice Project.